There are many different reasons why we have a hard time getting rid of clutter. I’ve blogged about them, delivered presentations on them and discussed them with fellow organizers. I thought it would be fun to explore what Feng Shui has to say about clutter. According to this ancient philosophy, it’s not laziness or lack of time that prevents people from canning their clutter. Clearing clutter is, however, an emotional process that can be very energy draining. Since feng shui is based on the flow of energy, it makes sense that clutter would block that flow. Think about this: How do you feel when you enter a space that’s contaminated with clutter? (Think teenager’s bedroom.) A space that contains no real sense of organization or order can get you feeling quite tense, stressed and maybe even a little angry. Now imagine a space that has an absence of clutter. (Think spa, aka the opposite of teenager’s bedroom.) Openness, order and simplicity can create feelings vastly different than those brought on by the teenager’s bedroom. Feelings of peace and contentment are much easier to obtain when there’s not clutter blocking your chi (energy). 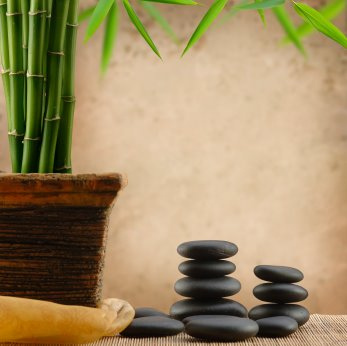 Feng shui is an ancient art and science developed over 3000 years ago in China. Feng shui is a system of laws considered to govern spatial arrangement and orientation in relation to the flow of energy. It’s principles are used to balance energies in a space to bring about good fortune. It is pronounced “fung schway”. Clutter is low, stagnant and confusing energy. What is cluttering your space impacts feng shui. Where clutter occurs impacts feng shui. Remove clutter from your entryway, so you and your guests enter your home with positive energy. Get rid of stuff you don’t like. This sounds simple, but the negative feelings you have for your husband’s “dogs playing poker” picture can surround you with negativity every time you pass it. De-clutter your bedroom. According to feng shui, a cluttered bedroom might be the cause of your sleepless nights. Fix broken items. That patch on the wall that you’ve been meaning to repaint…that’s negative energy. Get rid of things you don’t use. Unused items symbolize dead energy. While the ancient art and science of feng shui is much more complex than just picking up your laundry and throwing out junk, it’s one more reminder of how damaging clutter can be to our well-being. It causes stress, anxiety and irritability. In studies, clutter has even been linked to serious stress-related health issues. So, whatever your personal philosophies may be, you can always benefit from clearing your living and working spaces. It has been feng, (I mean fun) exploring this one, though.